Some seats came up for sale. How much lighter are the gt3 seats than the 986 leather seats. Anyone try them? Are they comfortable or would they get old quick. 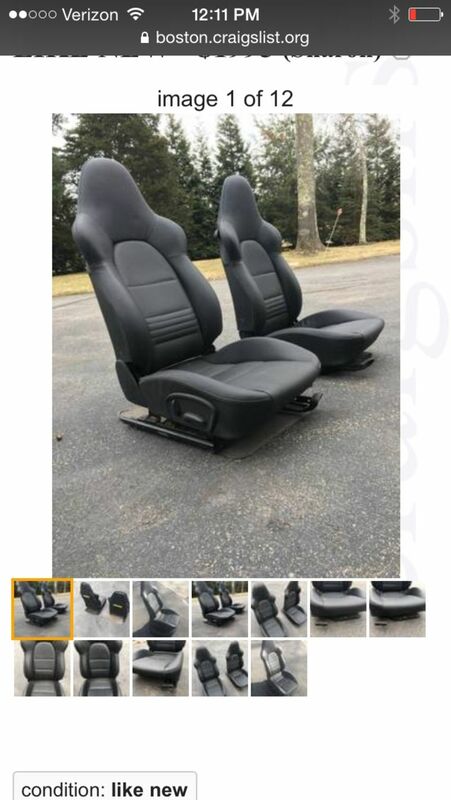 Show a pic if you can, if they are the Recaro alien eye seats, sets including the rails usually go for $3000 and should be a fair bit lighter than the stock seats. 996 GT3 comfort seats are barely and different to the seats you get in a 986.
comfort seats - what you probably have in your car. sport seats - what is shown in your pic; they have the shoulder 'wings' that comfort seats do not have. also typically less motorised adjustment so a bit lighter. hardback sport seats - also called euro gt3 seats (or just gt3 seats) lightweight buckets (lwb) alien eyes, etc. considerably lighter. your pic shows a set of sport seats that were mounted in a gt3; different than 'gt3 seats' but no different that sport seats that would have come in any other porsche. The GT-3 seats in the photo weigh around 50lbs each. Not much (if any) of a weight reduction.